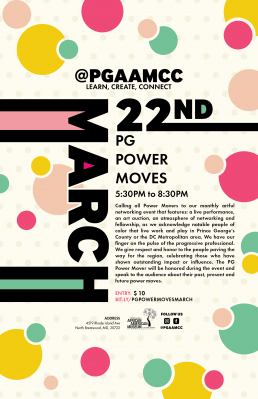 On March 22, 2019, PGAAMCC launched its first PG Power Moves! Program, honoring Pastor Omo Ghandi-Olaoye of Jesus House DC. In celebration of Women’s History Month, Pastor Omo was the recipient of a PG Power Mover Award, for her dedication to serving women as the founder of Jesus House Women’s Ministries of Jesus House DC. Pastor Omo’s ministry addresses pertinent issues of womanhood from birth to old age and their outreach provides services and resources for over 5,000 women locally. 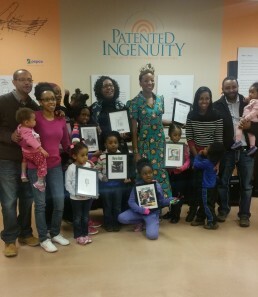 Pastor Omo was given a certificate, an original piece of art by Quest Skinner, and a space grant to host a community event for her ministry. A local DJ provided entertainment for the evening and PGAAMCC’s galleries were filled with over 55 guests from the Jesus House DC congregation and neighboring communities. For many, it was their first time entering our space. The PGAAMCC staff were welcoming and visitors meandered through the space observing the contemporary art and historical archives. Pastor Omo arrived to music, a red carpet, and a cameraman. 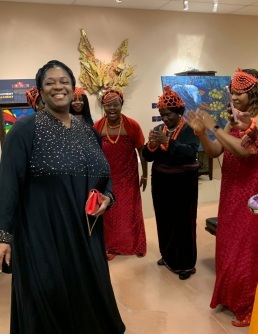 The staff made collages of Pastor Omo, her family, and the congregation, with the goal of ensuring she felt honored and the members of her ministry welcomed her with dance. All enjoyed the space, and took time indulging the artwork talking, and communing with one another. In addition to the two art exhibitions: Protest Garden and Soul Illuminance: A Retrospective of Quest Skinner, the night highlighted artist Kayode Malomo. Over a dozen of his pieces were on display, decorating the main convening gallery. 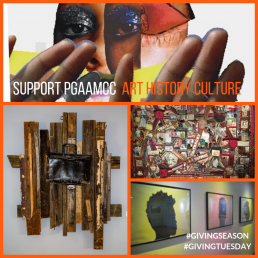 art appreciation and art patronage is part of the unique value proposition of PG Power Moves and all are encourage to buy, behold and celebrate the featured artist works on display in our silent auction. 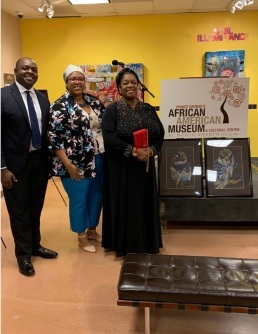 After Executive Director, Monica O. Montgomery offered a warm welcome, Pastor Omo Ghandi-Olaoye gave a keynote speech describing her dedication to women and the extensive ways she serves and centers women in the local community. The environment was electric. Volunteers connected with guests at the membership table and guests stopped to pick up fliers and hear more about our upcoming programming. This event was a beautiful way to honor Pastor Omo and welcome the congregation of Jesus House DC to PGAAMCC. Thanks to all who came to support and honor Pastor Omo Ghandi-Olaoye’s community impact. PGAAMCC was featured in Washington CityPaper, article by Laura Irene. 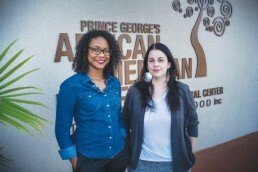 Through its education efforts and programming, the Prince George’s African American Museum and Cultural Center strives to be a pillar in its community. The term Chocolate City has historical significance in Washington, DC. Coined in the 1970's by local radio personalities and made popular by the funk band Parliament, the term did not solely indicate the color of the population but also the vibrant communities and cultural pride among its residents. For Deejay Bobby “The Mighty Burner” Bennett, Chocolate City “was the expression of DC's classy funk and confident Blackness;" it was about being Black, proud, and in power. Not only were Black people the majority, but they also had strength within the city through politics, business ownership, music, and culture. Now, during a time of dramatic demographic and cultural shifts, PGAAMCC’s Chocolate Cities Exhibition Series will explore the legacy of and track the continual changes within the nation's capital and Prince George’s County. Chocolate Cities Group Exhibition is a multidisciplinary art exhibition highlighting the changing cultural and economic landscape of Washington, DC and Prince George's County, MD through the eyes of local artists. In the past decade, Washington, DC has dramatically changed due to population growth, gentrification, and government policy. It is no longer the same Chocolate City that the funk band Parliament referred to in the 1970s, but it still remains distinctively DC. The work included in this exhibition seeks to open up a discourse on gentrification, cultural sustainability, and economic growth in a way that recognizes individual experiences as well as collective memory. Through an examination of the history of Chocolate Cities, and an interrogation of current challenges such as economic segregation and gentrification as a form of cultural castration, this exhibition will open up a discourse on historical legacy as well as methods of sustainability in the face of a rapidly changing cultural and economic landscape. Chocolate Cities Group Exhibition is curated by Martina Dodd and showcases original works by featured artists: Tim Davis, Lloyd Foster, Lionel Frazier, Sheila Crider, Michael Booker, and Larry Cook. The Chocolate Cities theme takes lead in the Museum’s teen after-school program, Culture Keepers. Students in the program are currently researching historically African American counties, neighborhoods, and cities - locally and nationally. Under the guidance of PGAAMCC’s Scholar-in-Residence and Teaching Artists, Culture Keepers students will create artwork based on their findings, which will to be featured as an exhibition at the Museum in June. 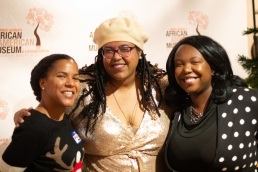 PGAAMCC Education Coordinator Dr. Synatra Smith states, “Our Students, who come from all walks of life and ethnic backgrounds, are very excited about the Chocolate Cities theme this year; they get to learn about Black history and culture through a contemporary and creative lens. For example, we just led a presentation about the Netflix show Luke Cage and explored the significance of an African American bulletproof superhero charged to protect a historically African American community: Harlem. 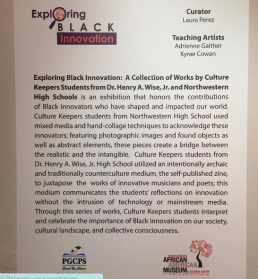 They loved the presentation and post-discussion because it incorporated their pop cultural interests into engaging scholarly discourse.” In partnership with Prince George’s County Public Schools, the Culture Keepers after-school program takes place weekly at three school sites: Suitland, Dr. Henry A. Wise Jr., and Northwestern high schools. Join us Saturday, April 16th for Early Keepers.